A typical look: Echelon’s par-3 3rd, playing over a Rees-ified bunker with pillow-soft banks. The above quote, proclaimed by Ricky Gervais’s character in the original British series The Office, is clearly false. Especially in real estate, where timing is as important as location. 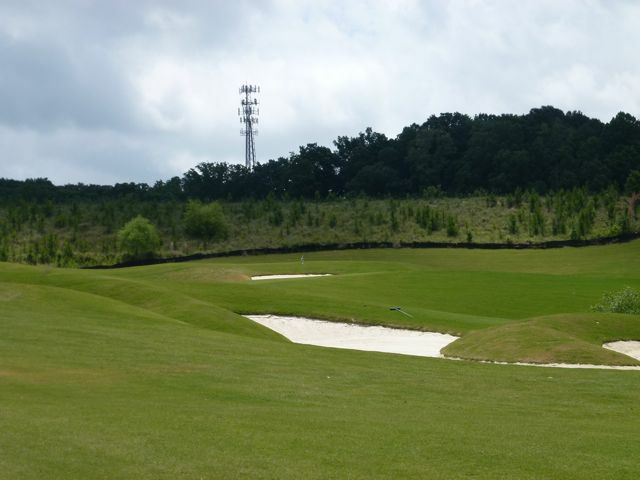 For the developers of Echelon, a would-be prestige-level golf community north of Atlanta, what seemed like a good idea in the early-2000’s turned into a disastrous idea by the time the development opened in 2006. Echelon was conceived as metro Atlanta’s latest and most exclusive luxury community, featuring a private Rees Jones-designed course branded as The Georgia Tech Club, all-star amenities and custom-built luxury homes with lake and golf views. A decade in only a few dozen homes had been built, the clubhouse and dining facilities existed only in concept, lots were selling for a fraction of their opening listings and the golf course was accepting on-line tee times. The collapse of the housing market in 2008 was certainly a kill shot for Echelon, but that only tells part of the story. 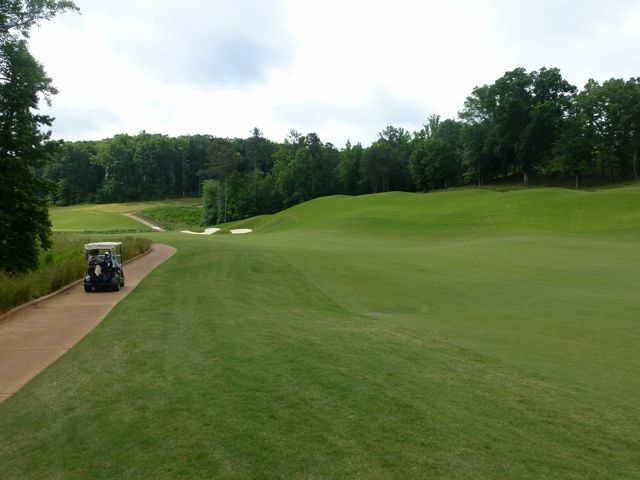 One could make the case that by 2005 or 2006, Atlanta’s appetite for luxury golf and overstuffed real estate in hard to access places was already sated. What was once a good idea–building upscale housing developments anchored by private golf clubs in the ever more northern suburbs–became a tired, if not fatal, idea. To wit, the Echelon course sold in 2013 for just $1.5 million (it was appraised at $8.5 million in 2008, and cost more than that to build). Few holes at Echelon fit the natural land as well as the lovely 13th. If only more holes were like this one. That’s not to say buyers will never again be attracted to property this far removed from centers of business, retail and pleasure, even though many families are moving in the opposite direction. Perhaps Echelon can find the right combination of factors to become sustainable or even successful. But it would help if the golf course was worth moving, or driving, out here for. Like the development itself, this course should probably never have been built. 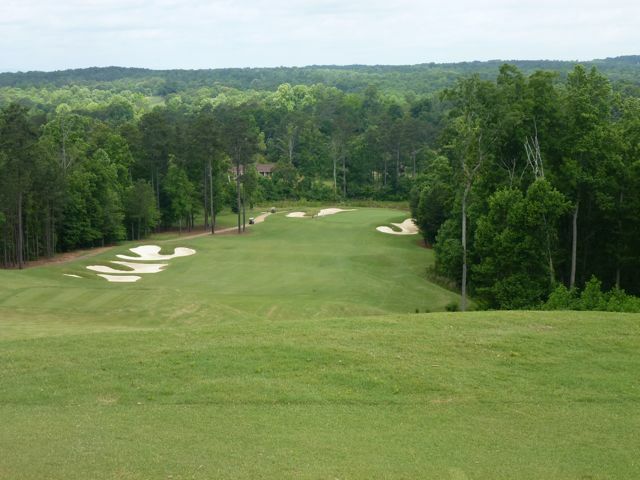 The property is not only undistinguished compared to a dozen or more comparably hilly north Atlanta courses, but major parts of the second nine are hostile to good golf. 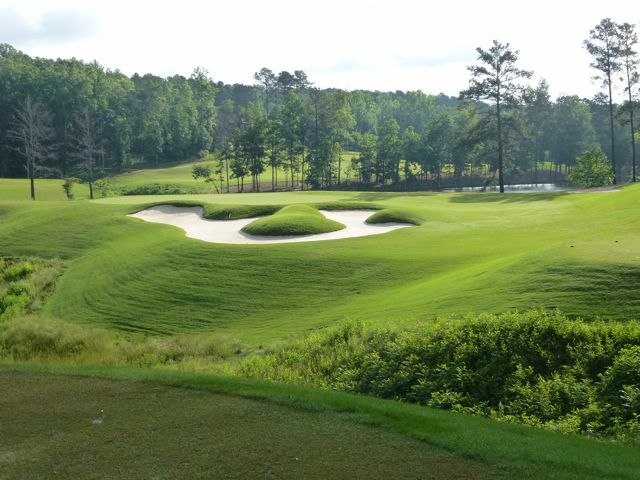 While the first nine offers one or two holes that feel natural, like the par-4 5th featuring one of the course’s widest fairways and most elastic tee shots, most are cut-and-fill jobs benched into slopes surrounding a small lake and marshy creek. 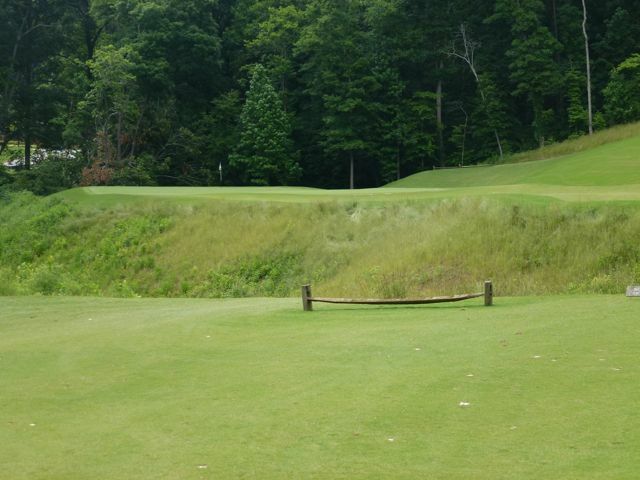 There’s usually a high embankment of rough and a cart path on one side and a hazard tumbling below on the other. 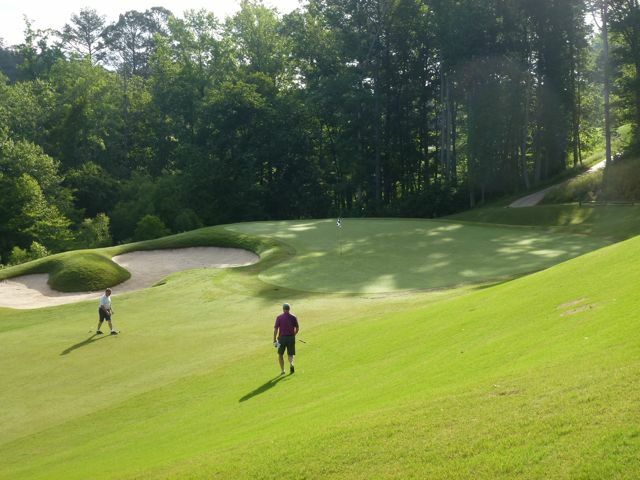 The side descent into the par-4 second green: a recurring theme at Echelon. There’s nothing inherently wrong about this kind of design; in fact, it’s brutally necessary throughout most of north Georgia. But beyond slick greens and admittedly strong conditioning, Echelon’s routing and architectural choices don’t do much to lure players and prospective members here versus somewhere else. Jones wasn’t able to solve the site’s problems any differently than Arthur Hills did (and almost every architect since) at The Golf Club of Georgia, Towne Lake Hills and Olde Atlanta in the late 1980’s. But the real travesty begins on the second nine. It opens with a shortish fallaway par-4, basically a less refined version of Jones’ 12th at East Lake, setting up a tricky downslope pitch over a deep bunker into a shallow green. That’s fine. Then comes the par-5 11th, an awkward hole that curves along a sunken jungle on the left and a manufactured wall of grass on the right, the built-up tee complex for the 16th hole. The fairway slithers along the cut until it meets a ravine, on the other side of which is a deep green perched over more gaunch short and left. From the landing area at the long (561 to 618 yard) par-5 11th, you just try to advance the ball as close to the end of the fairway as possible. Third shots here will be 130 yards at a minimum to perhaps 200 yards or more if you haven’t played a long precise drive and ideal layup. For many players this will mean another 50- or 60-yard third-shot layup to get into position for a reasonable fourth shot over the gully. Ridiculous. All this is too bad because the green site hanging out over the flora is the most interesting on the course, even as it’s maybe the most difficult. But poor sight lines, a more than usual manufactured feel, the bizarre arrangement against the 16th hole, the forced layup, lack of options–Jones should have never allowed this hole to be built. The dangerous 11th green site is worthy of more than what leads up to it. Putting routing decisions aside, the land for the 11th could have been better divided into a short, sporty par-4 bolstered with strategic bunkering followed by a demanding, possibly Redan-style par-3 into the hanging green. The land for the current 12th–a short par-4 that’s so uphill (very nearly 100 feet) that a series of terraces in the fairway are required–would seem less forced as a stout, elevated par-3 where only one bench, the putting surface, would be needed. And even if the par-5 14th were kept as is–another uphill slog requiring more terracing and severely uneven lies–the anodyne downhill par-3 15th and par-4 16th could then have been combined into a sweeping, dynamic par-5. I have no alternate suggestion for the 18th, one more strange uphill hole with odd terracing and tilting and little sense of purpose or composure, except to just scrap it and stop at 17. It would be a huge letdown if you weren’t already so resigned. Would a majestic clubhouse behind the 18th green make this hole more understandable? It’s doubtful. Of course this version would have given Echelon back-to-back par-3’s and par-5’s on the same nine, and you get the feeling, given his background and output, Rees Jones would rather walk barefooted through the untamed thickets that surround the course than do something so unconventional. But that’s why architects like Tom Doak, Gil Hanse, Bill Coore and Ben Crenshaw and a handful of others continue to get the world’s best golf properties: because they read the land and do on it what’s natural and intuitive, rules be damned, rather than force standardized par-72, 7500-yard courses on site after site, whether it works well or not. In an era when golf writers were accustomed to being ushered from place to exotic place via air, Derek Duncan broke into the profession the old fashioned way: by car. Upon moving to Florida in 2000 and finding himself amid the greatest population of courses in the country, he began embarking on weekly golf expeditions throughout the state in an old Honda Civic.